Mr. Rocky Lane with his Pool Students at the Hong Kong FCC Pool Society Academy, executes a legitimate jump shot. Raising the cue ball up over the orange five ball to a level of 12 inches from the table. It descends down upon the black eight ball which disappears into the center pocket. This shot is known to have been radar checked at 40 mph whilst in mid air. Many of his class students, are known faces in the Hong Kong corporate world, as Presidents and Vice presidents of multinationals. Rocky's Sunday Pool Academy at the FCC comes in quite handy for those too busy to spend hours in a Pool Hall learning the hard way. Achieve a good bridge and overhand bridge for the cue. "Make" (pot) a ball very near a pocket four times consecutively and done twice. Achieve a good cue action, and administer weight distribution. Eg. Push cue ball to a bank or cushion and have it return to within six inches of your cue tip, as expected with the lag. To test grade two ability; level one line ups done twice must be completed successfully and the six inch cue tip rule must be achieved twice successfully. Be able to participate in a game or whrack with an opponent and make or pot object balls without much positioning for the next shot. Three correct positionings out of eight "pots", done twice, will achieve grade three. At gradings, a tactic known as "chalk spotting" will be used to test this grade three ability. Upon correctly positioning twice, pursuant to the chalk spotting rule will pass as a grade three pool player. 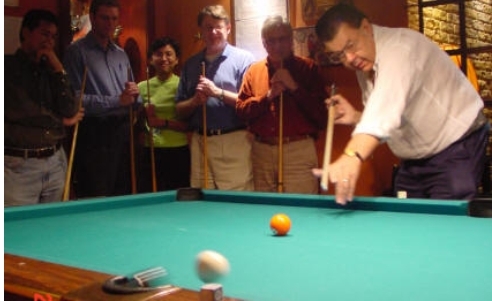 The ability to apply side, or better known in Pool as "English". Grade Four also expects brief knowledge on "stop shots", "roll through shots", "draw back shots" and "swerve shots", only to be mastered at higher grades. The students are to achieve twice consecutively, six correct positionings out of 8 pots via the above chalk spotting system. Also, the student be able to achieve a stop shot, roll through and draw back shot twice consecutively. To master positioning and twice pot seven "clean" shots out of eight attempts from what ever non-snookered position on the table, during the course of any wrack. For this, a system known as "spot shot training" will be the testing device used at the grading. Pursuant to the spot shot rules, students must achieve twice within the grading period, four pots out of six attempts within two minutes. Begin committing regular "wipe outs" or "wrack outs" whilst in normal play. With eight clean pots from eight clean shots, in a wrack - meaning from "break" onwards. The opponent does not get a turn, being the definition of a wipeout or wrack out. Students may experience wipe out whilst doing standard table time (homework) or during formal lessons. When it does happen, they must record in their TTL, the words "I committed wipe out once (or whatever) today." on the page dated for that day. They must keep doing so every time it happens, and have their opponent or a witness sign it. Grade six is self graded, as one can not known when a wipe out will happen. Most pool instructors are holding Grade six status. Therefore, to gain grade six status, one must commit two wipe outs within a period of one 24 hour day, which must be signed by a witness. Upon achieving this, reporting, and showing proof of it to their instructor, they will be then expected to successfully complete a swerve shot twice consecutively. Going around an opponents ball and potting their object ball. Likewise, a legitimate jump shot shout be committed twice consecutively. Is to not miss clean shots ("clean" means not snookered. Even doubles off the bank or cushion, and regularly commit wipe outs consecutively one after the other. Grade seven players are instructors who have elevated to tournament competition players at national and world class status, with an accumulated rating over the years. Most world class pool players and world title holders, hold grade seven status. Names like Earl Strickland, Effren Reyes, Fransico Bustamante etc. are grade seven players. Repeated and consecutive wipe outs are the ultimate test to prove that one is at the highest level in this professional sport of pool.